Preliminary Chart of the Entrance to Pensacola Bay, Florida. 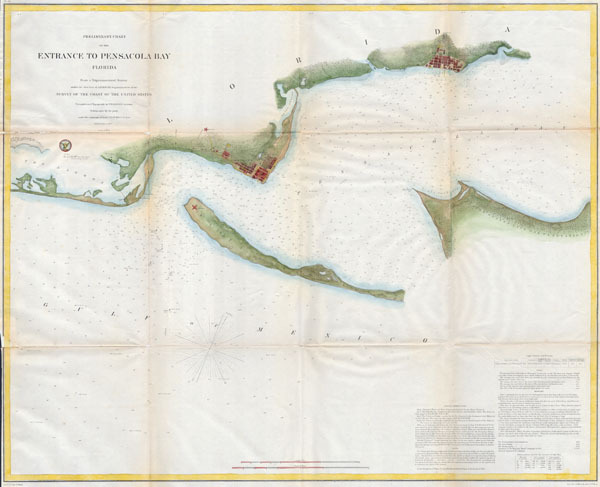 This is a rare hand colored 1857 U.S. Coast Survey nautical chart of the Entrance to Pensacola Bay, Florida. Covers Pensacola Bay from The Lagoon eastward past Warrington and Woolsey to Pensacola. Depicts the Islands of Santa Rosa and Fort Pickens as well as the United States Live Oak Plantation. Reveals the area in considerable detail, even inland, including a number of individual buildings in both Warrington and Pensacola, among them, the Redoubt, various lighthouses, the Navy Yard, the Marine Hospital, and the U.S. Military Barracks among others. Numerous depth soundings dot the Bay the Gulf of Mexico beyond. Prepared under the direction of A.D. Bache for the 1857 issue of the Report of the Superintendent of the U.S. Coast Survey. The triangulation and topography for this map was accomplished by F. H. Gerdes. The hydrography was completed by various parties under the command of J. K . Duer. Very good condition. Minor verso repairs and discoloration on original folds. All margins narrow but intact.